We’re getting a grain bin! 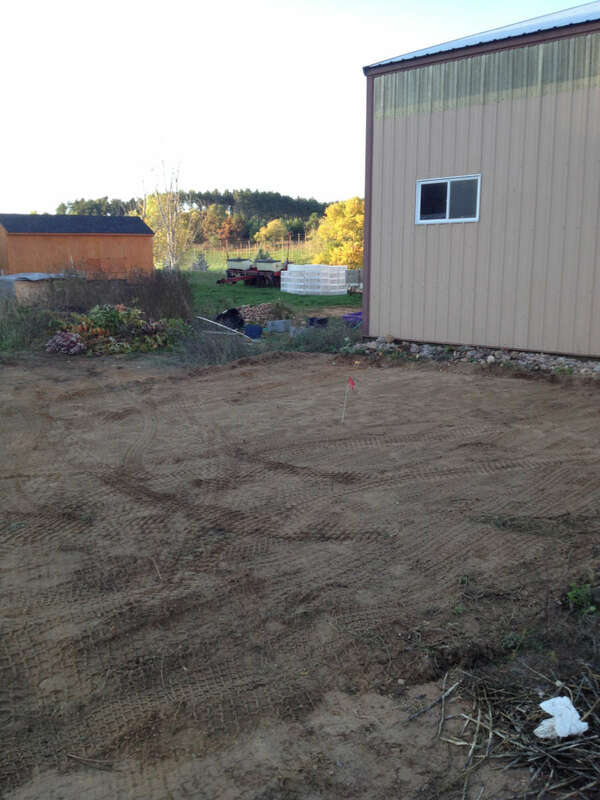 Here’s where it’s going to go, and thanks to Maria’s Dad and our friends the Bronks, we cleared the space in no time. It seems so simple to say we’re getting a grain bin, but there’s so much that has and will go into this. It’s a good example of what smaller farms like ourselves have to go through when they are starting out, trying to grow and expand AND trying to sustain an existence let alone the environment and everything else. You see, people often ask questions about why aren’t you doing this, or why don’t you do that yet and they’re great questions, really. The hard part about answering them is that we want to be these things, but so many of the decisions that come with starting any business–let alone a farm–boil down to money. Can we afford it? Is it even worth it? Does it help us become more efficient, save money or meet some other goal or set of goals? So, let me answer some of those questions for you and illustrate what this will mean for us. First, we can afford it. We’ve paid off the loans we had out for our walk-in freezer and our high tunnel, and the farm is doing well enough that taking on another loan won’t be a major issue. That is, other than being able to throw that chunk of money into the profit zone, haha. Which brings us to the fact that this grain bin is very worth it. Sure, it will be the biggest loan we’ve taken out thus far for equipment, but it will allow us to store the corn we grow. Hence, we will be more efficient because we will have taken some degree of control over a chunk of another chunk of our expenses (see under: “Feed”). It will also help us save money because it costs us a LOT less to grow non-GMO corn than it does to buy it on the market and have it trucked to the mill……if you can FIND non-GMO corn that is. How much less? Well, it’s often said that non-GMO corn on the market is about 150% the cost of the round-up ready varieties. If we went off of today’s price for next year’s round-up ready corn, say May 2014 corn, then a bushel of that corn will go for $4.65. To give you an idea of how volatile corn and other commodities are, corn you buy today is around $6.00 per bushel and last summer it set a record at over $8.35 per bushel. Anyway, we’ll stay conservative with the $4.65. If we take that price, 150% of it is $6.98 per bushel for non-GMO corn. In case you were wondering, organic corn is often 200% the cost of round-up ready corn, sometimes more. On our farm, we are smalllll potatoes. Well, small corn. We’re growing 13-14 acres this year and hopefully every year from now on. If we assume a harvest of 100 bushels per acre, we could get 1,300 bushels of corn. It will probably be less, but let’s roll with that number. 1,300 bushels of non-GMO corn trading at next year’s price that is currently $6.98 per bushel means we have $9,074 dollars of corn in the field. What did it cost to grow that corn? We’ll also have to borrow a couple of gravity boxes to transport the corn from field-to-bin, hopefully borrow a grain auger to get the corn into the bin and borrow a grain cleaner to run the corn through before we put it in the bin. If we can’t borrow the auger and cleaner, that will likely run us another $1,000 or so depending on what we got. A good gravity box can cost a lot, but if we went with a couple of smaller versions, we could probably get them for $2,000-$3,000. This year, we’ll borrow them. This is equipment we’d reuse for a long time too, so we shouldn’t include it in the costs above (it should be counted overall though!). Of course, we also had to buy a corn planter (4-row), a cultivator to weed most of the field, and a disc to till with. I got great deals on all of those, so we ended up spending $2,750 on them. So now we’ve got the bin to take into consideration. How much is a grain bin? Well, based on the numerous quotes I received this year, a bin in the neighborhood of what we wanted ran anywhere from $21,000-$27,000. Holy Corn! Granted, this price includes everything one needs to store the corn (the bin itself), dry the corn (fans, heaters if you buy them, stirators if you buy them), all of the ‘small stuff’ involved and eventually what you need to unload the corn so it can be used. It also counts the labor involved, and I’m definitely paying someone to put it up since I never have and there tend to be these little clauses in manufacturer’s warranties about how valid they are if you put it up vs. they put it up. It also counts the concrete, rebar and fill gravel one would purchase. It certainly doesn’t help that metal costs a lot more than it used to. This is a brand new grain bin too, and it will last as long as I’m alive…probably longer. One can buy used bins if they can be found, but finding the size you need is pretty difficult. A lot of them are HUGE or very small…not much in between. This is the plight of the modern small farm in America for almost all of the equipment they use. Anyway, if you find a bin, it tends to be in North Dakota or something like that. So, you also have to drive there, take it down, put it on a trailer or a semi, transport it back to the farm and then pour the concrete (etc) and put it up. You can hire that labor out too, but that will still run you at least $2,500 unless your uncle is a grain bin putter upper. You see, it is possible to save money this way, but you have no warranty, you’ve bought someone else’s problem and you’ll still have to buy fans, dryers, stirators, unloaders and many other things. It all depends on the ‘deal’ you manage to find. Ok, so now we’re getting to cost recovery on this thing. If we’re saving $6,000 per year, we can pay it off pretty quickly with money we would’ve spent buying the corn we grew on the market. Four years or so seems reasonable. If we assume that this year’s corn buys the equipment and covers the costs, we can buy lottery tickets with the $24 we net in savings, hope for the best and pay it all off in five years. Does it meet one of our goals? This is probably the most important one for us, and this has been a goal of ours for quite some time. We just weren’t in a place where we could actually do it. Now, we can grow most of our own feed, and we have a bin that will hold two-and-a-half times the amount of corn that we need per year. That means we can either grow into the bin’s capacity, or we can use that space for something else. We could play the markets and buy/sell grain with that space (ugh), we could buy non-GMO corn on the market when it’s cheap and use ours when it’s expensive (yay), we could even help people by drying their corn or other crops and/or storing their corn with ours. This last one is great because if we can help other people, then we can help them get to a spot where they too can buy a bin, or they can keep using ours and use the money they didn’t spend on a bin on expanding their farm. In the end, no matter how you look at it, getting a grain bin is a major step for our farm. There has been an incredible amount of research, talking with those who know and hand-wringing over this all too, but we’re excited about getting this bin and we wanted to share the news with you. The reason this post is so long is because I wanted to try and give you an idea about everything that goes into something that can seem as innocuous as “We’re getting a grain bin!”. Cool, wet and overcast October days like today remind us all that tomatoes are on their way out. Ok, I’ll admit it…they’re basically gone. Sure, you can find them here and there if someone has a heated greenhouse or a seasonal high tunnel–like us–that they’re growing tomatoes in, but now all we really have to look forward to (?) are hydroponic versions of this red fruitable that many call a toe-may-toe (i.e. what many of us will be buying at our local supermarket soon/now/ugh). No, not the tomtato (<--check that link out) but the watered-down version of the essence of summer, Italy and patio gardens. I respect hydroponic agriculture of course, but I'll never be able to convince myself that their products taste the same as those that spent most of their time out in the weather and in the dirt. You know, 'REAL' tomatoes! But I digress..... Who or what is this Salmorejo Cordobés? Well, a good friend of the farm let me know that such a thing existed, and when she described it to me I was instantly hungry and eager to make this dish. First of all, I should give credit where it is due, so for the full details on Señor Cordobés please head over to Bon Appetit. What is it? Soup. Soup? Yes, but to call it a soup really doesn’t do it any justice in how your brain and/or taste buds will interpret it. It might be helpful to know that “Salmorejo” is a Spanish synonym for “Gazpacho” and “Cordobes” is referring to Cordoba, a city in southern Spain where–funny enough–Gazpacho originated. Buuuut, there’s just something more to it. It ‘is’ simple as delicious food goes, and it fits nicely into the newly discovered culinary world of ‘simple’ that seems to be focused on allowing you to taste what, exactly, is in the dish. In the end though, for me, it is one of the few recipes that really got me excited this summer and boy/girl did it deliver! I’m sure that you’ll enjoy it, if you can find any tomatoes anyway, and I know that you can make it. Yes, even those of you who think you can’t cook at all or you burn everything (did I mention you don’t cook this soup?). If you do try it, let us know what you think. I’m sure your soul will thank you. In closing, a BIG “Thank You!” to Magda who brought Señor Cordobés into our lives. What it stands for is, “Advisory Committee on Beginning Farmers and Ranchers”, and this committee is appointed by the U.S. Secretary of Agriculture since, “The Committee provides recommendations to the Secretary.” Why am I writing a post about this? Well, I learned today that I—Chris, in case you’re still wondering which one of our voices you’re hearing on our website, Facebook, etc.–was appointed to this committee, and I am REALLY excited about being able to serve in this position for the next two-year term. You see, we got into farming not only because we thought it was an area with a lot of potential that we could do well in, but because we really want(ed) to affect change in our food systems. This has been a real guiding force in the way(s) we farm, and it has also led us to get involved in local-, state-, and now national-level groups that are doing their best to improve things for farmers, local food organizations and the public in general. As some of you know, Maria’s folks have an acre of hops that they put in three years ago, and we help them out with that from time to time. One of those times is when the hops need to be harvested. Actually, three of those times since there are three varieties that they’re growing (Cascade, Columbus and Nugget). It’s year 3 of the hops operation, so the plants are well on their way to maximizing their potential. Given the drought last year though, we may have to wait for year 5. We’ll see. In any case, harvesting hops can be quite the ordeal. Year 1, we picked everything we harvested by hand. We also helped a friend down the road with their hops, and they had a lot to pick by hand. If you’ve never picked hops by hand, you won’t appreciate the videos posted below as much as someone who has. Why? Probably because you didn’t realize that picking ONE hops bine can take up to 45 minutes. 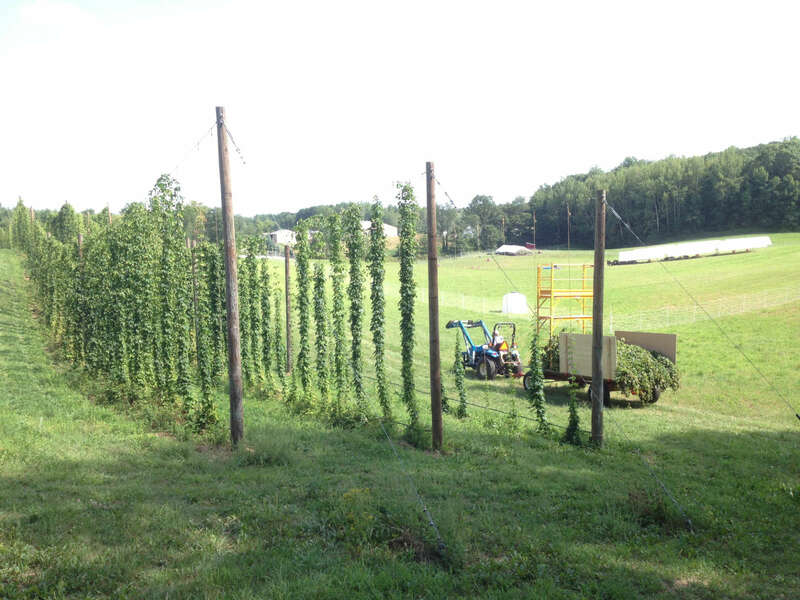 On an acre of hops, you’re looking at around 1400 plants. That gets labor intensive in a hurry! Needless to say, we no longer pick by hand. Instead, we cut the bines (not vines) off of the top and bottom cables and stack them onto our hay wagon. Then, once we have our full load we drive that down to our previously mentioned friend’s farm. There, we are lucky enough to be able to use their Wolf Harvester, which can strip up to 100 bines per hour. Once we’re at our friend’s farm (Bronk Family Hops Farm), we each take our positions and the fun begins. Usually there are two people unloading bines from the hay wagon and loading them onto the harvester. The harvester then pulls the bine inside where there are a series of choppers and ‘filters’ that separate the hops cones from the bine and then ultimately spit the (mostly) clean cones out of the bottom and onto an elevator. The elevator runs them up into the barn where they fall into some sort of container, usually a small tub. As they move along the elevator, a couple of us are grabbing any leaves, stems or other ‘trash’ to make sure that what gets to the container is only hops. Once we have the hops cones, we head back home where they are placed into the oast. 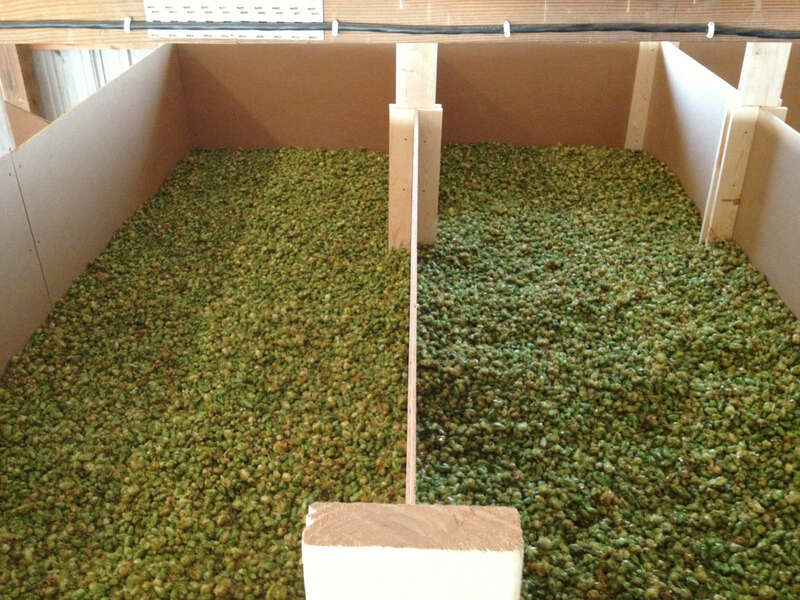 The oast is what dries the hops down to the appropriate moisture content. 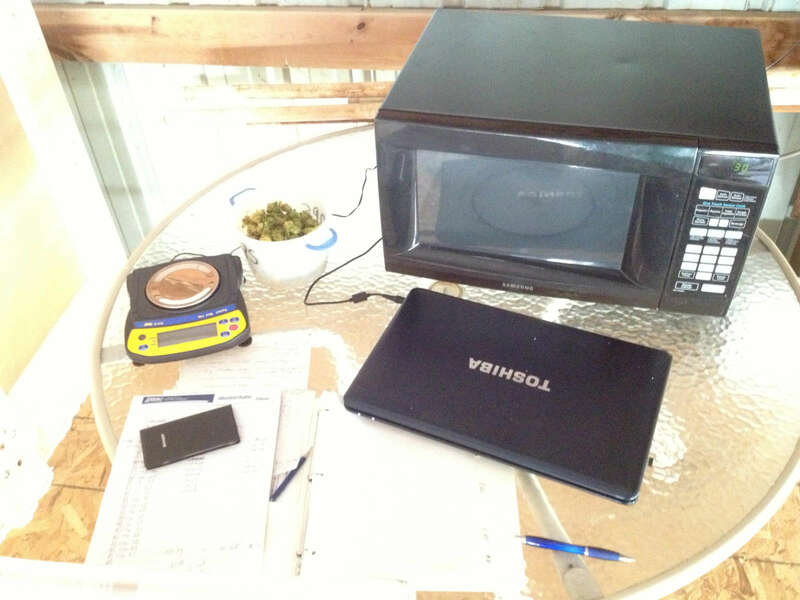 In order to ensure that you have the right moisture content, you have to do a lot of sampling, heating/cooking of the hops and…math. Once you have everything at the right place, you bag it up and place it into some sort of humidity-controlled environment until you transport the hops to the brewery, the hops exchange or some other end user. Hops are an interesting plant to grow, as they are very vigorous once they’re established. They also require a lot of nitrogen when they’re in their big growth stages. It’s said that some days you can see the hops growing. They do require a lot of work, but if you enjoy a good beer it’s hard to complain too much about what all goes into it. There’s a lot more one could say about hops too, but this–at the very least–gives you an idea of what we’re doing when we say we’re harvesting hops. So, this morning we wake up and it’s raining. This is good for the soil, good for the plants, good for the animals, good for the temperature, and it is also good because it means we can slow down (a little) and even get a hold of people like us who can’t be plowing in their fields today. I’ve been meaning to write a post here too, but haven’t had the time. So what have we been up to? Our main project is probably getting ~11 acres of corn planted (12 if we can). What has that entailed? First, you buy the seed. This isn’t necessarily easy because it’s later in the season, and we’re trying to find non-GMO seed. Managed to find seed and even source it through a guy just down the road. Then, we need to turn fields of pasture into fields prepped for planting corn. This means having an implement to do the job. So, we bought what I think is a 12′ off-set disc from our friends over at Bronk Family Hops Farm. If you didn’t know, and I didn’t, an off-set disc is a heavy disc that you pull through the field and it is exceptional at shallow(er) tillage than a plow would be. Any other year, we would plow, but since we’re short on time we decided to disc instead and hope that meant fewer rocks to pick. It does mean that we’ll have to make several passes with the disc to make sure that we kill the grasses and alfalfa and sod that the field has been in for years. When I asked for advice around here, everyone I spoke to said we should spray the fields to kill everything. We’re not doing that, but we may pay for it by having lower yields, bumpier fields and more weeds. We also purchased an older 4-row planter that will do well for corn after a few minor repairs. The planter has a front disc that cuts a small furrow into the ground and drops some fertilizer in if you want (there are fertilizer bins above these discs). The next disc is set at an accurate planting depth and it drops one seed at a time into the furrow based on how far apart you want them. Around here, we’re looking at ~26,000 seeds per acre. We can’t plant much higher than that because our soils aren’t the best. If you plant tighter, your corn will compete with itself. Lastly, we purchased a 4-row field cultivator for $150! This was a steal. We got it home, replaced all of the shovels on it and even have new tires for it now, and we’re spending ~$300 for what’s basically a new implement now. A cultivator like this one is what you weed row crops with, especially if you’re not spraying. Four rows of corn spaced 36″ apart leave the majority of the field not in corn. Weeds will come up here, and they have to be dealt with. The cultivator pulls a series of small shovels through this area and rips the weeds out of the ground. Unfortunately, a weed like crab grass will grow anew on any cut segments (it’s a survivor! ), so we’ll be propagating crab grass a little bit. The worst part is that we cannot weed the corn row itself unless we spray or we walk 11 acres and weed what would be just under 300,000 corn plants by hand. Needless to say, we won’t be doing that any time soon, not even on a rain day. So, our yield will go down because of that as well. We’ll see how this year goes, but I’m looking at it as a learning year that will be a good foundation for future planting. Of course, it’s roughly a $5,000 experiment, but it has a high potential pay-off. The only thing to find now is more land since we’ll need to be putting our land into a healthy rotation for the soil. That means, at best, we’ll get two years of corn out of the land we’re planting this year before we have to put it into something else (beans, hay, etc). If we are marginally successful though, we’ll grow most of the corn we need for our feed, and we’ll be able to insulate ourselves (and you) from the volatile commodity markets. So, what else? Well, we got two cats (Smokey & Spur) from a local farm, and we’re hoping that they become expert mousers. They live in the arena, they’re very cute and they will soon be very deadly for a population of mice and rats that don’t know what’s coming. We also purchased two pigs from our friend, and we’ve got them out on pasture as well. They LOVE Alfalfa, and it’s fascinating to see how easily they stick their face into the ground and root up a foot or so of sod. They’re basically powerful shovels with hoofs. We planted 300′ of raspberry plants. We started our perennial garden by putting in a bunch of rhubarb. We’re monitoring the asparagus beds to see if anything we planted last year comes up. We planted seed, which is not the best way to go, but we harvested the seed ourselves…so it’s the free way to go. All four of the bee hives we had last year survived the winter, which is kind of a feat for the bees (I won’t claim anything since I purposefully don’t do too much to bother them) since this was a terrible year for winter bee survival nationwide. We have around 1,500 broiler birds out on pasture, 100 or so turkeys ready to head out that way (200 more are coming for Thanksgiving, these birds will be for market), and we’ve been successfully hatching heritage turkey eggs from our breeding flock for the last week. We’re up to 22 out of 25 eggs at this point I believe, with about 15 or so to go. We’ve inoculated 2/3 of our mushroom logs (we will have 100) this year, so next year we’ll have a lot of shittake mushrooms! We’ve successfully unpacked the barn from Winter, which is an endeavor. We’re also in the midst of converting a 25.3 cubic foot chest freezer into a refrigerator (basically plug it in with a thermostat temperature control on it and set the temp at 40F) so that we have enough space for the eggs that we’re getting…which is a LOT of eggs. We’ve got some Khaki Campbell eggs incubating so we can establish our own flock of those as well, and we’ll be hatching out some of our layers’ eggs too soon so we can start hatching out new layers for the next group of layers. Basically, we’re trying to control as many aspects of our operation as possible. Aside from farming, Maria has been busy lately with Worldbuilders. She recently went to the Heifer Ranch in Perryville, Arkansas with some of her colleagues to work on the ranch, meet Heifer’s board of directors, do some teambuilding and basically strengthen the relationship between the two organizations even more. I have been busy with the Wisconsin Local Food Network, as I am part of the effort to plan the next annual summit. I also represented the WLFN at the recent Natural Product and Healthy Food Expo in Oshkosh, and I was able to participate in a panel with several major players in the local food movement and a couple of farmers like myself. It was a lot of fun. The farm also had a booth there, and we met a lot of new people and had a great time. This post is getting long enough at this point, plus there are a lot of things to do today even thought it’s a rain day. One parting thought after a crazy ‘Spring’ is that I’ve come to expect that every new project comes with a hundred or so things I know about and a thousand or so that I don’t. That’s part of what keeps this farming thing an adventure, and one that evolves on its own with only a little bit of control from us. That lack of control is scary, frustrating and exciting. It makes your successes stand out a little bit more because it’s really just you, everything that Nature can throw at you, a lot of hard work and a little luck. As always, thanks for being a part of our adventure.